Chupacabras are almost done. Here’s all the bits. We had to chop off all of the arms and legs for the molds to work best, so those will be on little labeled sprues so you will know what pieces go where. I was hoping to not have as many parts, but we just can’t have dynamic poses any other way. The parts should all fit together perfectly though and shouldn’t require pinning thanks to the little plugs we’re using. Since you’ll have to glue them together I decided to make these guys be man sized instead of dog sized, just so it’s a little easier to build and the parts won’t be all teeny. Hey,just saw that the savage beasts playtest rules were released, ill try and get some games in soon and send feedback when i can. Oh, and is there anyway to get your official terrain in US dollars anywhere? i cant seem to find any. They're not really totally official but I gave em permission to use the name and they made an update to their hotel model to give it a flat roof and we named it the Blackwater Palace. Some day I hope to make some of my own resin buildings, but the sculpting will be expensive and I want to focus on minis for the 2 new factions right now. Gotcha dude, was just curious, that palace does look cool though. Hey Just as a heads up I really dig the new website update you did! I don't know if you could, but if you could somehow combine the wild west style of the last one, It would be top notch. Thanks And yeah I plan to include more of those elements later on, right now I want to focus on getting the content all moved over. Eventually I'll be changing my domain names around so blackwatergulch.com will go right to the BWG page on the main site, and also in time I want to get my online store integrated so there's no more separate sites to keep track of I can just have everything all in 1 place. The store will take much longer to do though so I'm saving that for last. Then after that's done I want to start doing lots of videos, some just to show the models from all kinds of angles, but also how to play, how to paint, stuff like that. That will have to come much later though. Hawgleg Publishing (the guys who put out Gutshot) had a small resin building selection, and then acquired more. They never really did much with them. Mike Murphy and Mike Mitchell are both good dudes. I think Mike Mitchell probably has most of the molds and stuff at this point. You could possibly get with them and maybe come up with an almost 'turn key' start at terrain offerings. So I’ve been giving some thought to the faction ideas now that we have the Beasts on the way. I was going to save this for BWG2.0 next year or whenever I can make that happen, but I think I’m going to do this with a rules update to go with the Savage Beasts expansion. What I was planning is to have 1 big human faction with all of the current & future gangs, then the beasts faction with all animal type monsters, and undead later on. Kind of wondering if 1 big human faction is too much, and I should break that up more, into a Lawman and Outlaw faction. The Lawmen would be the Vigilance Committee, Widowmakers, Dockside Drifters and Wilde’s Rangers. Outlaws would the Clancy Gang, Bandidos Mexicanos, Secret Fist and Bloodwolf Tribe. Hired guns are neutral, they can join either side. I also thought about making the Tranquility Crew be neutral like hired guns, basically like a whole gang of hired guns? Sometimes their nice, and sometimes they aim to misbehave. The Beasts and Undead would be similar, 2 different factions, but Demons would be like hired guns and can join either side. Demons will be critters like the jersey devil, mothman, rake & slenderman. Anyway, I thought that might be a fun way to break things up a little. that way the folks that want to stick with a historical type of game can have 2 factions to choose from, and there could even more to choose you want to play with the monsters too. I could see where it could be a little much with everyone having a separate faction. 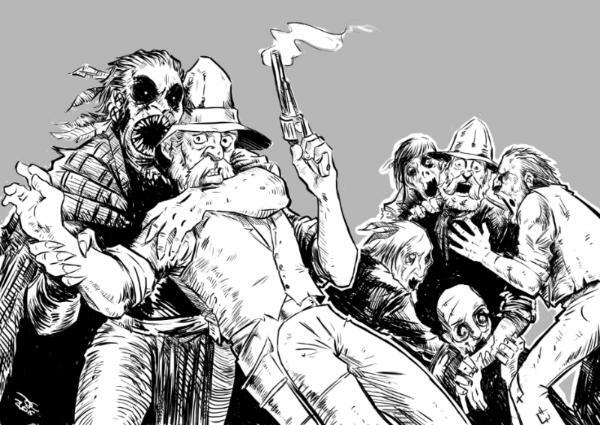 I do really like the outlaw and lawman faction idea, but if it were something like an end of the world scenario, and the gangs had motivations for joining outlaws and lawmen, I feel like that would be a good idea. Then again i also like playing to were my gang has a different motivation than my buddy's gang. I was thinking not so much an end of the world scenario, but more like it's become a really dangerous place and some gangs have set aside their disagreements to work together for safety or just to try and get more money. Only thing I'm kind of stuck on is the faction / race skills I was planning. Humans have access to all guns and artillery, beasts have running wild, and undead will be bloodsuckers (or brain eaters, same thing, they heal 1 HP if they take someone out of action). Oh also, 1 other thing I was going to do is update all of the character cards to the newer style I was using for Bad Lands, same content just a different look. There would be little icons for the attributes instead of “Str” and “Sta”, and an icon at the top to show what faction they’re in. The only thing is I can’t change the cards that are already in the boxes because they’re all shrinkwrapped and in a warehouse 4 states away, but the old cards would still be valid anyway. So I was going to have the new cards be download only, and maybe have a print on demand option for people that really want the printed cards, through Wargame Valut or The Game Crafter. And going forward, for new models I wasn’t going to include cards anymore since it’s an added expense and I want to have things be as cheap as possible. That’s why the stats are in the rules for each of the beasts. I was gonna make the cards be more like an optional kind of thing. Gotcha, I do enjoy having the separate factions with different motivations. I think I worded it wrong when I said "end of the world" I was trying to say "really dire circumstances" lol but I will say I do like having the cards but if you do decide not to include them I feel like the print on demand is a great option for a little extra. Yeah I wanted to remove the cards for a few reasons. For one, I have to use bigger packaging to fit the cards, and it’s an added expense. I’m trying to make the minis as affordable as possible Then there’s the issue of printing all those cards, organizing them, packing them, the more stuff we add in the more chances something can get missed. And then there’s also a lot of who folks buy the minis for other games, and just throw the cards out anyway so that seems like a waste. 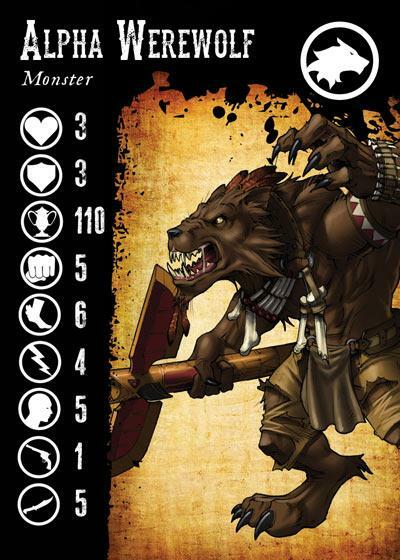 I thought going forward I’d offer them as downloadable PDFs, Print on demand for people that want a real card, and in new books I’ll print each character’s stats too like I did with the beasts PDF. That will also allow me to start packaging in small clamshells or blister packs that will be a lot cheaper than printing boxes. For packaging, what I hope to eventually do is retire the current gang starter sets after they are all sold out, and then sell those minis separately in smaller packs, then do new faction starters with new characters. So we’ll have an Outlaw starter set, lawmen, beasts and undead. Other characters would be sold in packs of 3 henchmen, 2 professionals or 1 hero/gang leader. Same thing with the beasts where they will have 3 minions, 2 fiends or 1 monster. Only problem is it’s a lot more expensive to sculpt new sets of men since everyone has to be unique. The beasts work much better since we just have to sculpt 1 in 3D and then just duplicate it to make different poses. So it’ll take a while to get new gangs put together. The new sets don't sound like a bad idea at all, I think Ill stick to the Wylde's Rangers army theme though. hopefully when the kickstarter begins we can get enough raised for some new human sculpts though. the icon in the top right is for the faction, and I'll probably do a different background color or something like that for each faction too, except for the minis I don't have art for, then those will get a photo of the mini. That looks awesome! really like the changes and keep it up with that artwork, it might just be me but i think stamina should be like a muscled torso or something along those lines. Yeah I thought about that but it just wasn't coming out right, so we went with the lightning bolt I'm going to shrink the icons down and space them out a bit, so there's a gap between the XP and Strength, kinda like the cards are now. The flip side is just gonna be plain text like now. Content is gonna be the same as the current cards, they're just getting a facelift. I'm updating the savage beasts rules now with the faction info, so I'm hoping I'll have that done in the next couple of days, then I can get started on all the cards I've also been thinking about moving some of the current hired guns over to the outlaw or lawmen factions, maybe just a 2 or 3, to give more options for heroes/leaders. Wow i actually didn't know the art was that expensive.the hired guns idea is neat, is it going to go along with the new box sets whenever those come to be? The art is cheap compared to the minis anyway, those usually end up costing over $1000 per mini including the sculpt and the molds and everything. I wish I were able to sculpt myself, I'd save so much money The big mechs from Mechadrome were more like $2000. One good thing about the Beasts though, is we only need to sculpt 1 of each kind, and then repose it, so that will help me get a lot more models done faster and cheaper. Humans and the undead will all have to be more unique sculpts that will cost more. I was thinking the new Outlaw and Lawman sets would have 5 all new characters, probably all the different heroes I was going to have in Bad Lands. As long as you keep the preexisting ones supported and around im fine with it lol ive grown quite fond of my wyldes rangers. Nope they're not going anywhere Just some repackaging later on but that's a long way off, not till the current box sets are all sold out and I need to get new ones made. Huzzah! a good day indeed, anyway though when will the kick starter actually start? Gonna make sure i got the cash for it. Gotcha, and thats a damn good looking expansion lol the cards turned out great. I have to say I do not like the Icons instead of words for stats. I think that would be fairly hard to remember all the time, but also I am a long time player and am used to the Acronyms and abbreviations. In general though, when I run the demos I have.. I thought the Widowmakers are sort of a "rogue" group of women.. a bit like the "wild bunch"
hmm .. well, I could keep it as the one big human faction like I originally planned, I thought that having the two factions + hired guns would be fluffier. Or does it just limit things unnecessarily? I thought this would also make it easier to handle new releases, so I could just make a couple minis at a time, like add in 1 new outlaw gunslinger or lawman bounty hunter. It’s a lot more expensive to sculpt a whole new gang, but I could probably handle 1 new sculpt a month to keep things more current and slowly grow the game without needing to use kickstarter all the time. I actually hate the whole kickstarter process, but I don’t really have any other option right now. For the icons though, I wanted to do that to make it kind of multi-lingual. Also when I would do demos it would seem like people get confused over all the stats (that or they just couldn’t hear me over the gencon cacophony) so I thought having an icon would make it easier to identify at a glance. I think I may drop the circles though, so it’s just a little picture. Funny thing just happened.. I got a big spreadsheet from Game Salute with all of the stock they have in the warehouse.. not the box sets, but all the loose items left over from the 2 Kickstarter campaigns, and there’s a LOT. A while back they told me I had thousands of dollars worth of stuff, but when they told me how many box sets it didn’t seem like much, but now I know why There’s the red and blue special dice, gamecraft buildings, secret weapon resin bases, and lots of solo minis. So, I will soon be adding a lot of that to my online store. This also means I’ll be able to sell solo copies of pretty much every mini I have, rather than just box sets. This started because I wanted to see how many bases were left over so I could get the gatling guns made to sell separately. Turns out they have 100 gatling guns just sitting there collecting dust So that will save me the expense of casting new ones, and I won’t have to wait till June to make them, I can pretty much just offer them as soon as I get the go-ahead from the warehouse (hopefully today). sounds like a problem that a lot of retailers would LOVE to have..
will await the webstore update! May take a little while I don’t think they have any of these extra items in their system for selling/packing/whatever so I have to wait and hear back from them to see what’s what. At the very least I hope we can get the gatling gun going and take it from there. but seeing how much extra stuff they have laying around I’d like to be able to offer it for folks that might not want every mini in a set, while supplies last anyway.